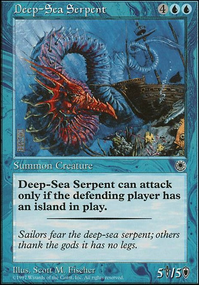 When Slinn Voda, the Rising Deep enters the battlefield, if it was kicked, return all creatures to their owners' hands except for Merfolk, Krakens, Leviathans, Octopuses, and Serpents. 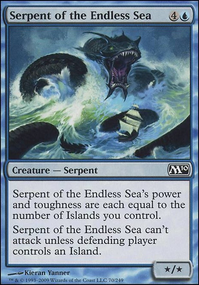 With all the sea monsters have you considered Whelming Wave ? 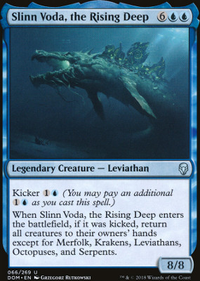 If you Ramp hard enough or cheat it out somehow (pretty sure you can still pay kickers on a free cast, don't quote me though) Slinn Voda, the Rising Deep works as a second Wave. Hope that helps some, +1 for ya, looks fun! Slinn Voda, the Rising Deep!? Excellent Addition. 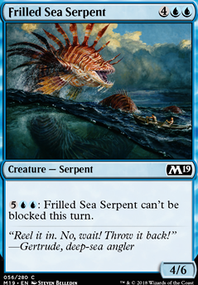 I'm thinking about Pull from the Deep to be able to cast whelming wave a couple more times. Yeah I can imagine. That seems like a lifesaver. Have you considered Slinn Voda, the Rising Deep? It is pretty slow, but fits the theme. Good deck though! 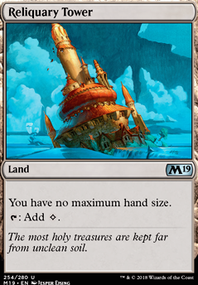 Just a momentary thought: Budget upgrades could include the land upgrades? Those seem like excellent includes for once you've purchased the other ones and you're looking to finish the job. Thanks for the upgrades guide, I've made a lot of use of it, adding some into the mainboard, and reserving a few that will be bought along with the 100 in the list, as a 15 card 'sideboard' of sorts, used to add in cards to power up the deck depending on what strengths I'm playing against. -Azami, Lady of Scrolls Solemn Simulacrum (I feel like Simulacrum does what Azami wants to do with better consistency, you only really want to be paying UUU for a creature that is its own excellent engine, such as Arcanis. 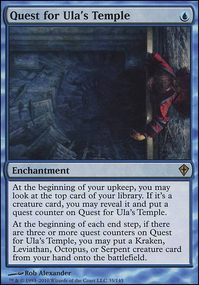 Azami needs way more wizards in the list to really get pumping, and unlike a Simulacrum, players will immediately respond to an Azami, they know it will generate game-winning card advantage, vs flashing in a chump block simulacrum for pure value-town, much faster than Azami's slow roller. Also, colour-less mana fixing. God bless). I kept Hushwing Gryff when I added Kira to mainboard, and instead dropped Aven Mindcensor for Kira, Great Glass-Spinner. The reason behind this being my playgroup has a krenko, as well as a bunch of other tribals. Tribal ETB's are powerful, I can't say no to keeping a hushwing in my back pocket. If I verse someone I know will play johnny combo, and search their library, I'll change between Censor and Hushwing accordingly. Quicksilver Fountain is another way to turn on islandwalk and slow down opponents' at the same time. Being able to connect consistently with combat damage opens up some fun avenues to explore. Coastal Piracy and Bident of Thassa for card advantage; equipment like Sword of the Animist, Quietus Spike, Bloodforged Battle-Axe, Dowsing Dagger Flip, Mask of Memory, Prying Blade, Rogue's Gloves, Specter's Shroud, and Spellbinder all give different options depending on what you feel you need more of; and for redundancy Thassa, God of the Sea is clutch. 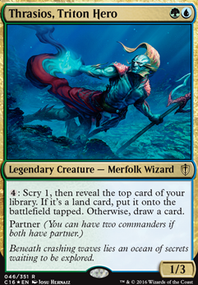 I cannot imagine merfolk do not engage with sea monsters and they would definitely give you some late-game push. Ones that spring to mind are Scourge of Fleets, Stormsurge Kraken, Slinn Voda, the Rising Deep, and Stormtide Leviathan. 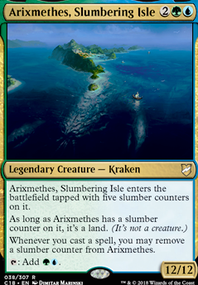 In addition to your pillowfort pieces I would also consider AEtherize to bounce an attack and Equilibrium to bounce threats as you play your merfolk. Throne of the God-Pharaoh could be potent with all of your sideways turning. 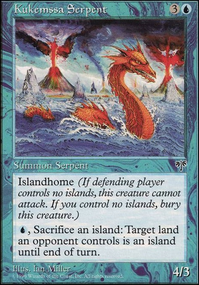 To complement this fact and reinforce merfolk's weaknesses (aka aerial anything) vehicles could work. Smuggler's Copter comes readily to mind. Master of the Waves - For being a 4 drop, it is one of the weaker ones that doesn't promote your game plan or give synergy. 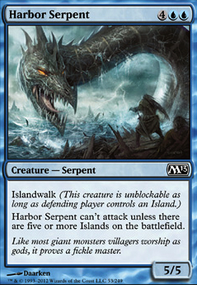 River Sneak - Beasically a vanilla creature, would replace with a one drop cmc creature. Sage of Fables - Just a bit too slow, aand not much synergy aside from the +1/+1 Counter card draw which is a tad too slow. Shapers of Nature - Same as Fables, but even slower. I would cut this card first over Sage of Fables. Slinn Voda, the Rising Deep - Too high cost for a asymmetrical bounce. I rather run a tutor (Mystical Tutor) to find Cyclonic Rift over him, or even more protection. Vorel of the Hull Clade - Doesn't fit with synergy, and costs every time. If it targeted every single one of your creatures than yes, but since it's a single target...no. Another suggestion will also be for the type of ramp spells. Going on curve I rather use the two drops like Nature's Lore, Farseek, Rampant Growth. But I do like Kodama's Reach and Cultivate. 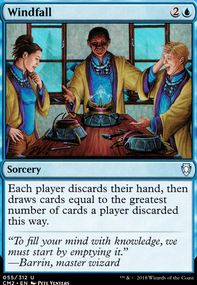 Jace, Ingenious Mind-Mage is also a bit too slow, if you have the chance or budget I would recommend Rhystic Study. Murkfiend Liege, Seedborn Muse, and Paradox Engine help you activate Kumena's abilities many times in a turn cycle. 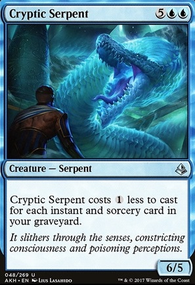 Cryptolith Rite is good ramp and a strong "tap outlet"
Growing Rites of Itlimoc Flip can make a ton of mana, and helps you dig towards your creatures as well. 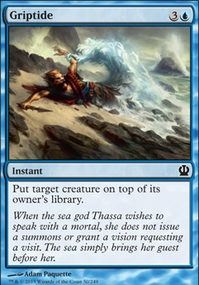 Tideshaper Mystic is the same; cutting one opponent off of mana doesn't do much, and 1/1s for 1 that die to board wipes are mediocre at best. 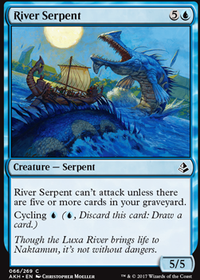 River's Rebuke isn't my favorite board wipe in Commander, even in blue/green. I'd play Devastation Tide instead. Slinn Voda, the Rising Deep just does too little for 10 mana. If you're spending 10 mana on a single card, that card should be winning you the game. 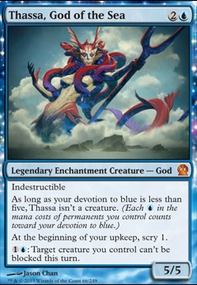 True-Name Nemesis is good, but mainly in Legacy. 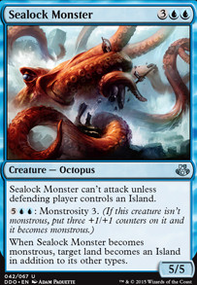 In Commander, a 3/1 that just one player can't interact with is bad. Shapers of Nature is a decent mana sink, but I think you'd rather just be doing something else with your mana. Hope this helps! If you'd like me to explain some of my choices more, or if you want help on another deck, feel free to leave a comment on my profile, and I'll take a look as soon as I can!